Getting sick of me yet? Maybe it’s the gorgeous weather, maybe my massive procrastination is coming to a head as I put off a dozen critical tasks in favor of taking pictures and writing about the yard. Whatever the reason for my creative spurt, it has inspired this post, at least three more to follow, and a recipe for the long neglected recipe section of this blog. Former park visitors gave AJ this “No Pooping” sign, because he raved about it so much. 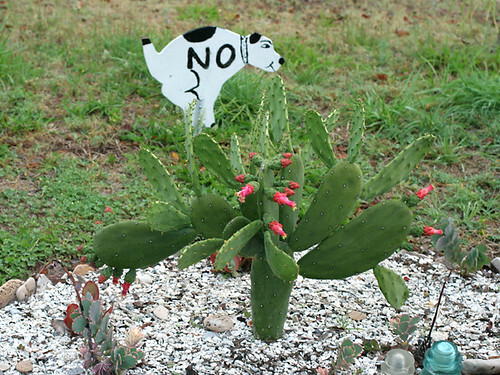 My focus is on the cactus, but the squatting dog does upstage the subject. Do try to remember the cactus; as it will feature in a future post. If plants could talk (and surf the internet) some of mine might have been miffed for being left out of the garden showcase post. If they could express emotions like pride and motivation, Oregano would win the prize. 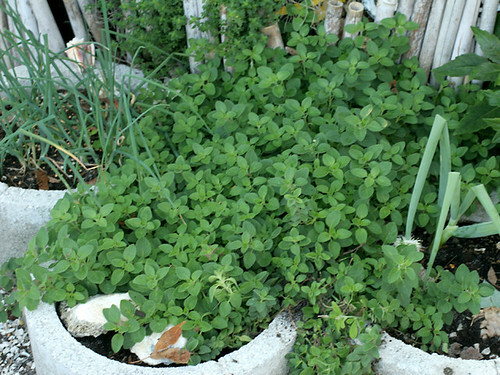 This plant is a real over-achiever, and is competing with the Mint for who can take over theirs and all neighboring containers. 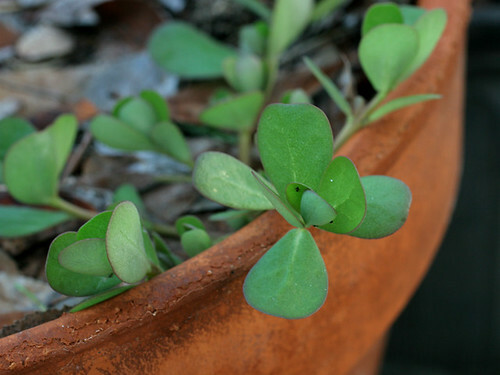 Purslane strives to shed its reputation as a weed, by being packed full of nutrition and by displaying plump, fleshy leaves and dainty, colorful flowers. This is my secret weapon should the Zombie Apocalypse happen in my lifetime. A person would be hard-pressed to starve with as much Purslane as we have around here. AJ is the tree enthusiast. He is cultivating Avocados, Papayas, Mangoes, and this Ponytail Palm that his mom has been growing for us. 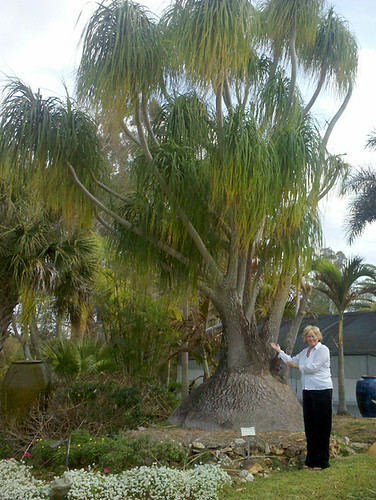 When she and Mark visited in January, they went to Rock City Gardens in Vero Beach and found this mature Ponytail Palm. We look forward to the day we can lounge in the shade of our own grown-up, primordial-looking tree that isn’t really a palm and stores water in its foot. 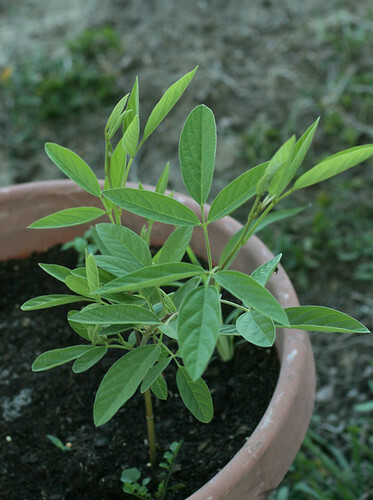 This Pigeon Pea is also supposed to be a tree. 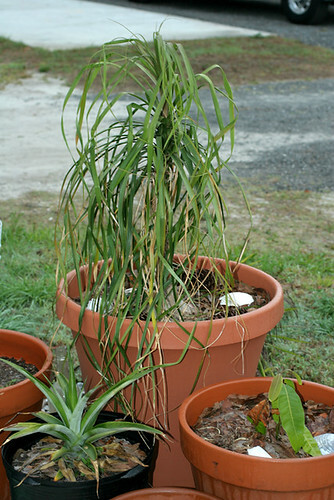 It is stunted after surviving the winter. 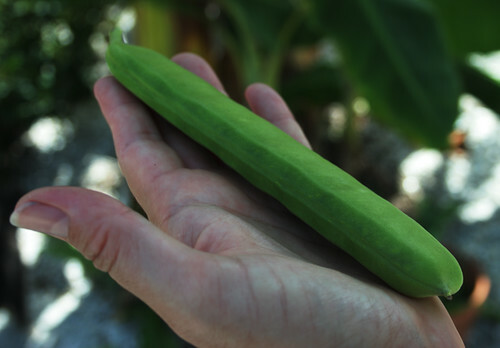 I won’t plant it in the ground, because it is an heirloom, of sorts, and I don’t want it to pick up the dreaded nematodes. All of the potted plants are going with us when we move, and we hope to leave unwanted stowaways behind. 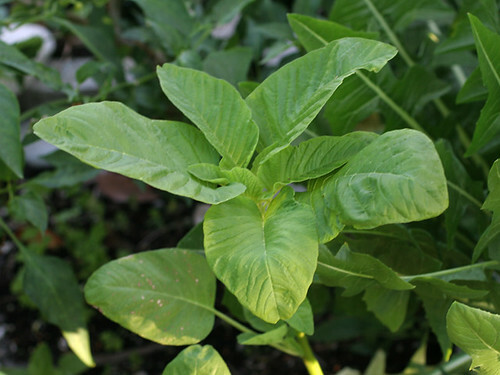 Amaranth or Callaloo is everywhere. The volunteers have popped up from seeds left by the one and only batch of these that I planted. Welcome weeds, they are, though. I call them “Secret Super Lettuce”, because they grow in the worst conditions, laugh at nematodes and have tasty leaves, great for salad or on a sandwich when real lettuce has long since gone bitter. They are also great as cooked greens. 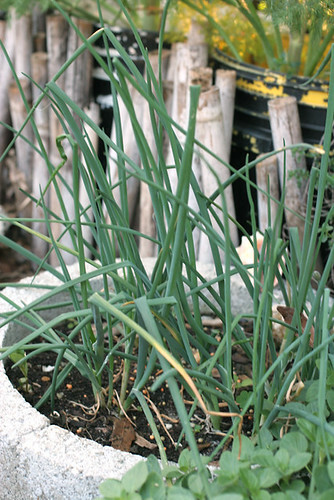 Chives limped through winter. They seem overjoyed with the warm weather and are preparing some lovely, fuzzy, lavender flowers for a future post. The Back 40 was getting primed for a feature. That was until AJ got rambunctious with the lawnmower! I told him to check with me before doing yard work back there. I had some great clumps of Gaillardia and Seaside Oxeye Daisies, which were doing nicely, and promising to bloom soon. I also had a little watermelon plant, that was thinking about growing up soon. So much for that. I came home, yesterday, to find that he chopped them down, as well as the Spiderworts I was harboring. At least he left the Crookneck Squash. I would have been pretty crabby to find that mowed down! With everything blooming, I had begun to wonder when the insects would show up. Activity is beginning to pick up. I’m starting to see my favorite beneficial insects, some that are more popular with me than most gardeners, and signs of the more rotten little critters who think I have been working on their own private buffet all winter! Stick around to find out who they are. Notice anything different about this photo? 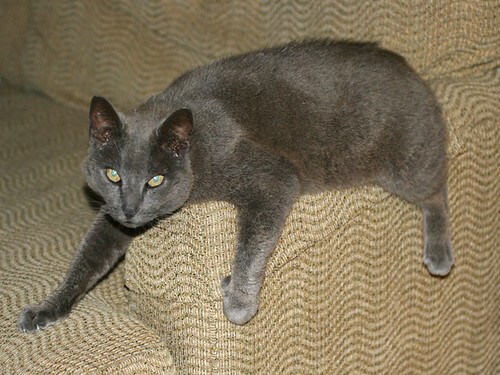 That’s right…Smokey is on the couch! Charming cat that he is, he has endeared himself to AJ, thus achieving indoor privileges. He is only allowed daytime, supervised visits; but he makes the best of them. Some day, when we get a video camera, I will record some of his antics as he plays with scraps of wood and runs up trees. For now, I will share the pictures of one of his latest naps. We call this a “Soft Spot”. After a long night out on the town, he bolts through the door and looks around for a soft spot. We place towels and throws over the furniture in an attempt to “cat proof”. 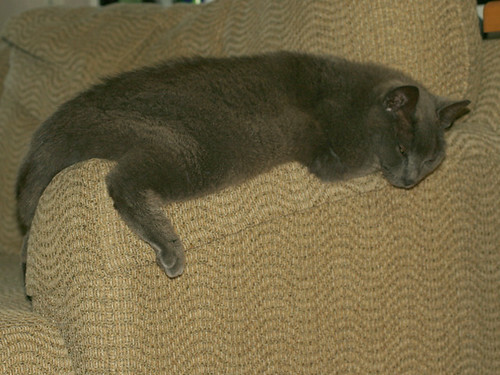 Strange cat that he is, Smokey prefers to drape himself over something uncomfortable, and unprotected instead. Whatever works for his cat self. He just seems grateful to be allowed inside. On February 21, 2004, AJ and I walked into a podunk wedding chapel in St. Marys, Georgia, and made our vows. No matter whether the production is flamboyant or low-key, most of us go into the institution with the expectation that we will grow old together. As we signed the marriage certificate, I had visions of future family celebrations, camping trips and waking up in 40 years to gaze beyond the wrinkled landscapes of each others’ faces and into cataract-clouded eyes. As our 7th anniversary approached, all of those dreams seemed to be at risk of slipping away. When we first met, I noticed an unusual mole on AJ’s back. I described it to him, and decided to keep an eye on it. Having recently experienced a minor basal cell carcinoma, I had a heightened awareness for all things that hinted of skin cancer; especially the dreaded, deadly Melanoma. The years passed. We built a life together. The infatuation ripened into love and dedication to each other and our future. We got responsible and started getting medical checkups. When AJ got into the VA program, they completed an extensive physical. Although the funny mole had not changed, I asked him to have the doctor look at it. He forgot, but the doctor found it on his own. It was measured and put under observation. Months later, AJ got around to a follow-up visit. He came back with the news that the mole had gotten bigger, and that there was another growth on his arm that concerned the doctor. A biopsy was scheduled. I had to work, so his mom, Karen, and her significant other, Mark, came for a visit and took him to his appointment. His mother was concerned, because she is a two-time cancer survivor, and the disease runs in the family. Perhaps it was denial, perhaps I had too many other things on my mind; for whatever reason, the thoughts of the biopsy were relegated to the back of my mind, and I continued on with the assumption that we would grow old together. The days came and passed, with no word from the clinic. I had planned a trip to Jacksonville for my stepmother, Judith’s, birthday and to see my dear best friends and my darling goddaughter, Madeline. As I was sitting on Judith’s couch, getting ready to take her to dinner, I got a call from AJ. The doctor had just called him. The story he got was that the spot on his back was melanoma and that the one on his arm was even worse. There was also something about his blood “not looking right”. So there I was, three hours away, getting ready to help celebrate a birthday and having to deal with news that the rest of my life was about to drastically change. I went numb (just like you always hear). The words were coming from my mouth, but it felt as though I was floating outside of myself, observing everything in slow motion. I tried to put on a happy face for the dear woman, who is still mourning the loss of her own life partner, my father. Although I had only just gotten there, I felt compelled to get back into the truck and go straight home. AJ assured me that he was OK (which I later learned was not really true), and that I should stay. The rest of the trip was darkened with the black cloud of a future without my beloved. When I got home, things were strange. AJ was subdued. His spirit was muffled. We went about our lives like robots programmed to audit bars and clean house and live a human life. I would have been a rusty robot, though; because I was on the brink of tears at all times. As soon as I found myself alone, my face was drenched. We acted like regular people (only nicer to each other than normal), but my eyes were puffy and red most of the time. I’m sure some customers suspected that I was dipping into illicit substances. The doctor had called on a Thursday with the results. The appointment, to have his stitches removed, was on the following Monday afternoon. Every hour felt like a week. Somehow, we managed to get our work completed. I also managed to whip myself into a frenzy by scouring the internet for information about melanoma. My own skin cancer scare had disturbed me, but the thought of being left without my husband was worse than the thought of dying, myself. The prognosis for metastasized melanoma is not good. Treatments are virtually ineffective, and the survival rate is six months to a year. Unless you are independently wealthy, the best hope is to get accepted into a study. I researched this, as well as natural cures. There is some good research indicating that chemotherapy with Dandelion root extract could be effective, and that even consuming the substance might help fight off cancer. I eyed my two Dandelion plants and wondered how many treatments I could squeeze from them. I planned out how I would nurse him through his last days. I even fantasized about taking him out to our sandbar on the lagoon, when the end was near, and helping him float on to the next realm in the least painful way possible. I even considered taking that trip with him. Mostly, I just reeled at the thought of spending the rest of my life alone. Who would I do everything with? How would I get my work done? Who would I go to when I was happy or angry or sad? How would I stay warm when winter cold crept into my bed? What would I do when things broke? I have always been grateful to be married to my best friend, but I never realized how hopeless and helpless I would feel without him. I suddenly felt motivated to complete the most mundane and tedious tasks. Everything that I have been putting off became acutely important. I imagined that I would soon be in no state of mind to do anything, and that I should get busy while I still could. It was as though the timer on my life was about to run out, and I wasn’t ready. We were noticeably more kind and loving towards each other during those days. It felt as though nothing external mattered any more, and that our parting memories should not be polluted with bickering or taking each other for granted. We were angry with the doctor for phoning in such bad news and leaving a long weekend to dwell on it. I was angry with myself for not insisting that he have the mole looked at seven years ago. I was frustrated with him for not taking it more seriously. The nurse nonchalantly pulled up the records on the computer, and stated that it was melanoma in-situ (which I had already learned was the earliest and least dangerous stage). He continued to explain that the growth they had removed from AJ’s arm was completely benign. We both let out a long breath, that we must have been holding for days, and barraged the nurse with questions about how the story from the doctor could have been so different from what he was telling us. 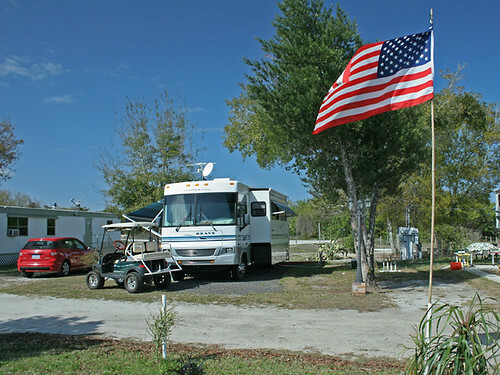 Relieved, and with a regained perspective, we left the VA clinic and stepped into the bright Florida sunshine. The black cloud was gone and we both shared an unspoken vow to be more thankful for what we have. An excision was scheduled to make sure that they had gotten all of the cancer. 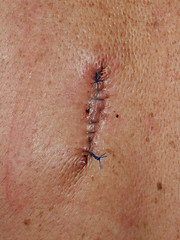 The surgeon assured us that it was as close to harmless as melanoma can be, and that it is a type of slow growing melanoma that many people have for decades without incident. He removed a chunk of AJ’s back that was the size of a human thumb. I think it would have been OK, had not the nurse shown it to him! It was a painful episode, and I let him milk it for every ounce of coddling. The remaining scar is one of the most beautiful things I have ever witnessed. When we came home from the results of the biopsy, on what had become one of the happiest days of my life, AJ got drunk, played the stereo loud and ticked off the neighbors. All is good though. AJ is alive, and so is our dream of being two old farts together! When you live the simple life (read: cheap) small improvements make a huge difference. We don’t have smart phones, nice clothes or super-fancy anything, but certain luxuries have greatly improved our quality of life. First, it was a new stereo receiver to replace the one that had a horrible high-pitched hum. Then, a 32″ flat screen Hitachi LCD TV to replace the failing hand-me-down we were previously going blind trying to watch. (Bear with me on this. I am really working to justify this TV.) Truth is that he got it for less than half of what it is currently selling for today. 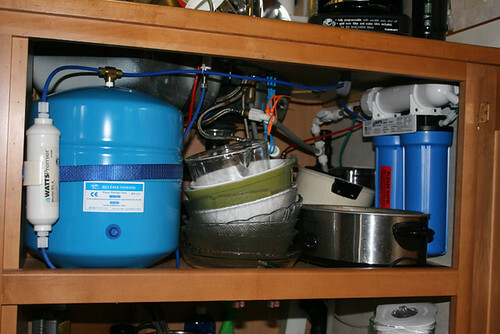 A reverse osmosis filter to get the salt, chlorine and other impurities out of our water. 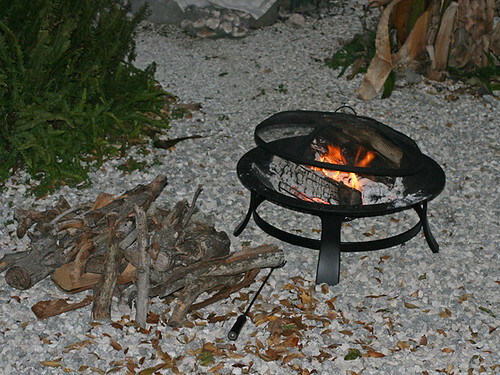 AJ’s mom got us a fire ring for Christmas. We’ve already had a number of memorable nights sitting (and drinking) around the fire; including the one night where his mom (after a Chardonnay infusion) demonstrated her best Yoga moves on the concrete patio. That night has gone down in history as the “Up-dog, Down-dog night”. One of our best purchases has been the RV. 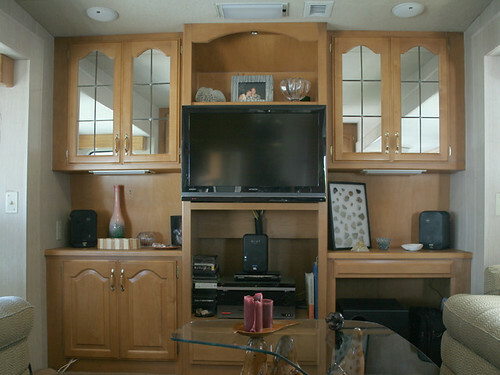 This fifth-wheel has served us well over the past six years; allowing us to live in affordable comfort as we worked through a difficult financial period in our history of marriage. A quick note for those of you who don’t know AJ, personally. His purchasing habits border on the obsessive. When a buying opportunity breaches the horizon he goes into research mode. For days, weeks, even months, he wades through the internet, interviews anyone who may have knowledge of the product and explores various retail outlets offering said item. This painstaking deliberation is both inspiring and agonizing to observe. By the time the money leaves our bank account, he is qualified to teach a college course on the item we are buying. Smaller purchases, such as flip-flops or an oil filter, might only take a week of research. 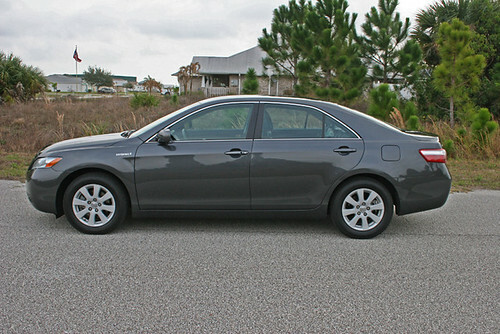 A larger purchase, like a car, can take up to a year (as was the case with our “new” car). The beauty of this is that he always manages to find the best value. Many of our belongings have actually appreciated since acquisition, and a good number more have held their value over time. 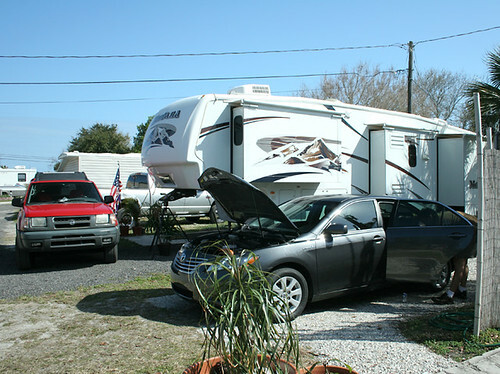 I can say, with confidence, that our 2008 Toyota Camry is right up there with the RV. The money spent on fuel and maintenance, due to our commutes to Orlando, was burning up our wallet. 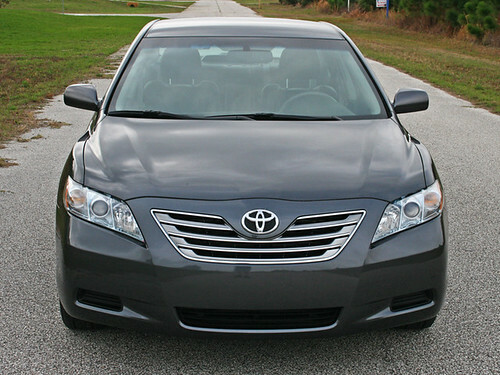 This car is modern, comfortable, looks and smells like it just drove off the showroom floor, and has a unique interior that is the envy of the members of the Camry forum (which has replaced the Mercedes forum as AJ’s most visited website). 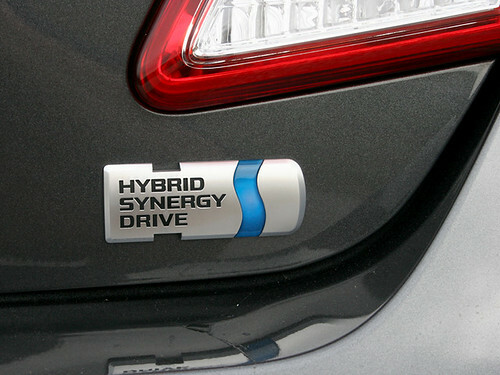 Oh, and it saves us so much money on fuel, that it almost pays for itself. Not exactly sure how he did this, but the first few miles he drove on this particular trip, he got 56.7 mpg. 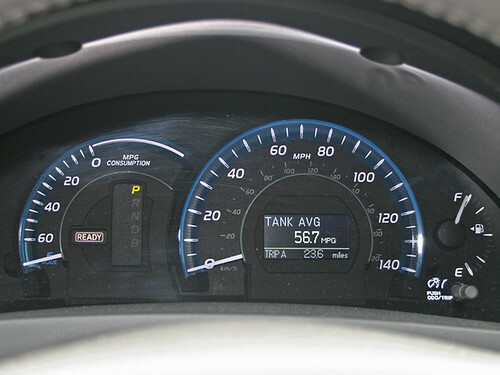 The actual average is around 40 mpg. That’s it for the new stuff that has recently improved our quality of life. I’ll be back very soon to talk about what we went through when we thought one of those lives was about to end prematurely. Four months ago I was making promises. I doubt that any of my readers were hanging on every word in hopes that I really would give an update on my Black Soldier Fly composter, or how much the park has been changing, or how many gray hairs were revealed the last time I went too long between colorings; but just in case…here goes. From this moment forward, I reserve the right to vanish from the blogsphere between the months of November and February. Birthdays, holidays, travel and familial obligations take precedence over photographing and rambling on about the mundane and sometimes disgusting things that go on around here. That being said, let us get on with the business of catching up. Forget about time lines. 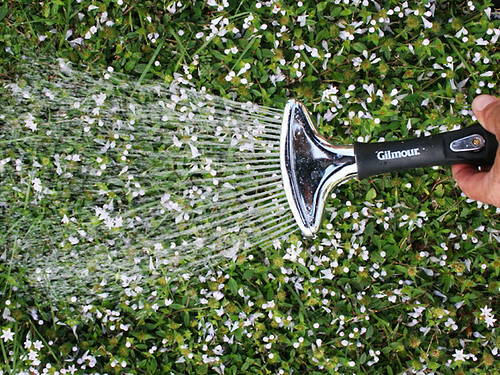 Forget about the rotten cold winter that tried to kill most of our favorite stuff. We have arrived in mid February, where the sun is beaming, the doors and windows are open and the birds are insanely upbeat. Things are great around here. One of the greatest things is that we don’t expect to be “around here” for much longer. Not that we don’t love the place, and we certainly don’t want to jinx it. So suffice to say that we expect our surroundings to change very soon. As it stands, they have already changed dramatically. 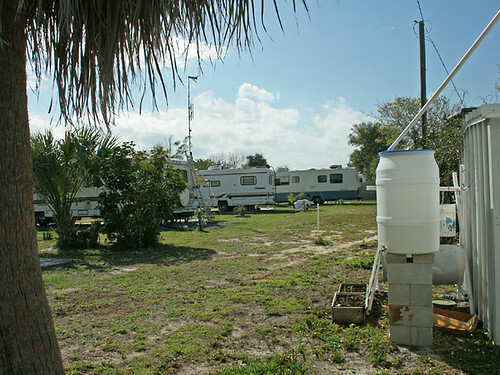 So much so, that I am now quite proud to announce that we live in Breezeway Trailer Park. If you are a new reader who has Googled your way to this page, please keep in mind that most everything about this park has taken a dramatic turn for the better over the last few months. Have a look around and see for yourself. Remember Jack, the junk hoarder in our back yard? Sadly, he was injured and had to go to a nursing home. Once his belongings were removed, the park owners cleaned up the lot and created a parking space made of crushed asphalt. The bean screen that I had built to block the chaos had finally given up the ghost; and since the view has drastically improved, we elected to remove it. 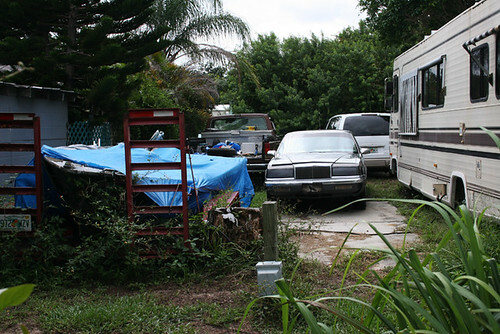 Since the cleanup, the lots along “The Back 40” have been much more active. Jack’s old lot is reserved, and the others are currently filled. 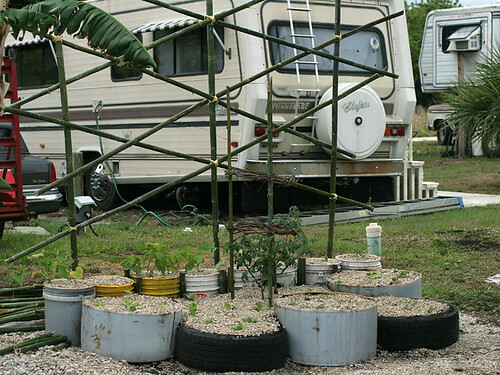 We have some really great neighbors back there, including Lee and Linda, who are also avid gardeners. Did you notice some barrels and PVC going on? Well, in the event that you have some unusual fascination with 55 gallon barrels, and the various uses thereof, let me indulge you. 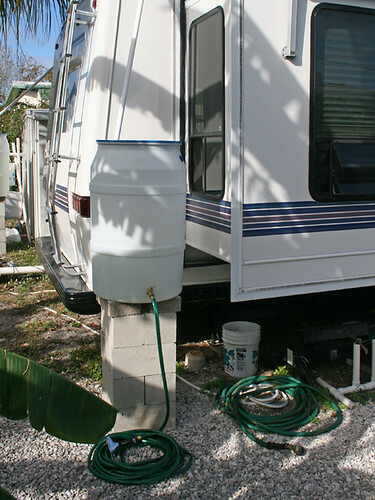 When it rains, the roof of the RV puts off more water than you can shake a stick at (or a PVC pipe, for that matter). I can’t be bothered to look up the actual climate zone of Micco, Florida, but my best guess is “Tropical Desert”. Every time it threatens to rain (and it rains a lot in the surrounding areas), the storm seems to split off and leave us high and dry, like a thirsty party goer who has waited in line for 20 minutes only to find that the keg is dry. When we do get precipitation, it is usually fast and furious; so we try to make the best of it. We picked up some 55 gallon barrels and AJ did his engineering magic by attaching drainage tubes from the roof to direct rainwater and air conditioner condensation into these storage containers. They are raised up on concrete blocks, with handy spigots at the bottom attached to hoses. We now have a nice irrigation supplement, which mitigates the need to tap into the park’s potable water supply. 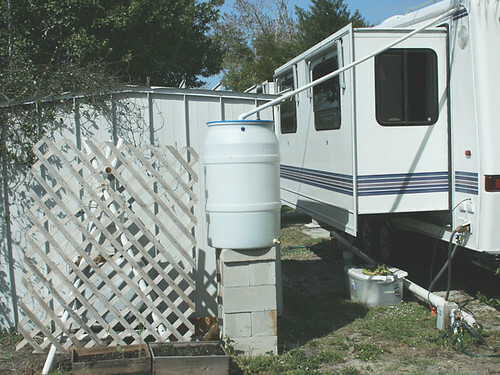 In downloading photos from the camera, I even found this shot that AJ took of the water pressure provided by the rain barrels. I just adore how he documents his projects! 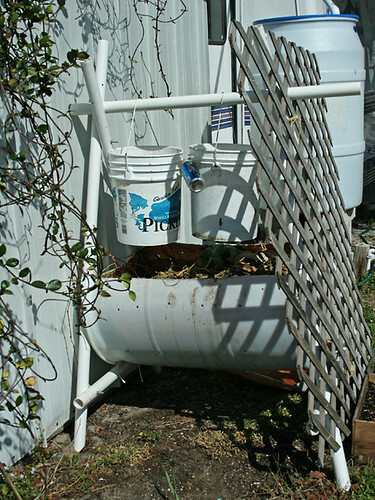 Oh, and remember my project, the Black Soldier Fly/worm composter? Here it is today. As it turns out, I didn’t have enough PVC/engineering skill to build a stable design. Once it had some weight to it, the whole thing started to lean at a dangerous angle. Things that lean can be unsettling, but things full of putrid, decomposing food and crawly maggots are downright scary. Being the innovator that I am, I came to the ingenious solution of letting it lean into the shed. I also hung a spare piece of lattice on the thing to disguise it from the front. I didn’t ask permission to erect this eyesore; but (fortunately) the park owners are green-minded, and actually contribute their own kitchen scraps to the cause. If you think that the back is an improvement, take a look at the front. 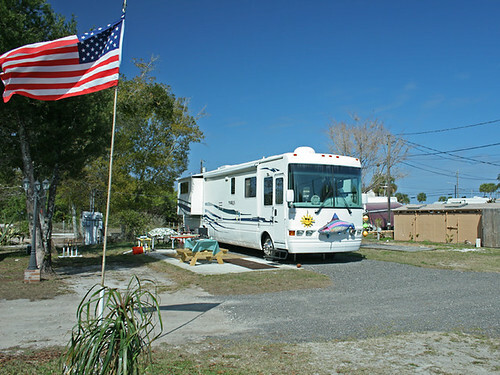 The two ratty trailers across the road were demolished and replaced with crushed asphalt and sod to create very nice RV lots. The spots were quickly filled by a group of very cool snowbirds from Michigan, who chatter in delightfully nasal voices and fill their days with fishing and metal detecting. We have new neighbors next door, too. They are younger (our age), with two dogs and a passion for gardening and good food. See that gray car in the foreground? Stick around for the next post, and I’ll tell you about that! Hello friends, family and accidental readers . If you haven’t heard from us, it is because we have been working 16+ hour days, seven days a week for a solid month now. Today is my “day off” if you want to call it that. I’m only here as a form of procrastination in silent protest to the mound of work on my desk and “Laundry Mountain” on the bed. I did do something slightly recreational yesterday and thought I would share it. If you have visited our place, you know that we have a compulsive hoarder in the back. Jack is an illustrious man with a colorful history and a brilliant personality. Unfortunately, he is physically and mentally ill. His compulsion to acquire and compile random objects continued until the day that he went to the hospital for back surgery. He is no longer able to live on his own and will likely end his days in a nursing home. However, his legacy lingers in the form of the small sampling of his collection pictured below. As long as he dreams of coming back home his lot rent will be paid and his clutter will remain. Shortly after Jack moved in I saw the writing on the wall and began to devise a solution for blocking some of the inevitable accumulation of that was sure to come. 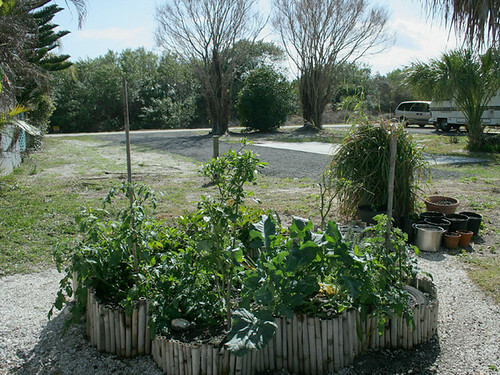 Back in April of 2009 we built “Oasis 2”, a combined raised bed with a bamboo trellis to screen the view of Jack’s junk. Over the past year and a half I have learned a lot about gardening. I had a good run with O2 before the nematodes and insects took hold and made it clear that tomatoes, pole beans and cucumber vines were not meant to survive long enough to climb the trellis, as I had imagined. 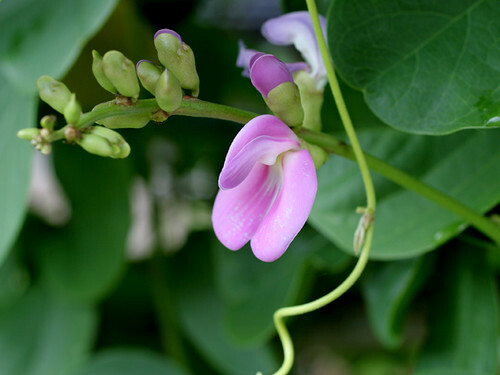 A trip to the beach brought my attention to a lovely wild native called Canavalia rosea maritima, also known as baybean. I became enamored by the plant’s lush foliage with its large, round, waxy leaves and its beautiful lavender flowers. After my battles with delicate heirloom vegetables I was open to a plant that was able to thrive in the salty, sandy environment of beach dunes. 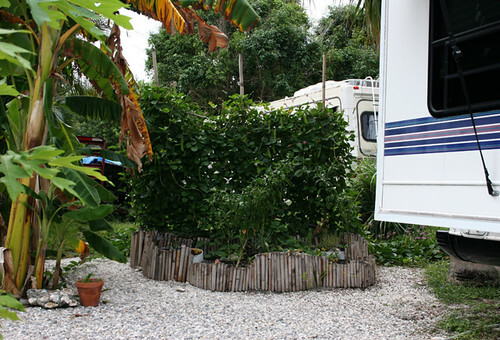 I read up on the plant and learned that it is ideal as a ground cover, and is actually used as erosion control in other countries. 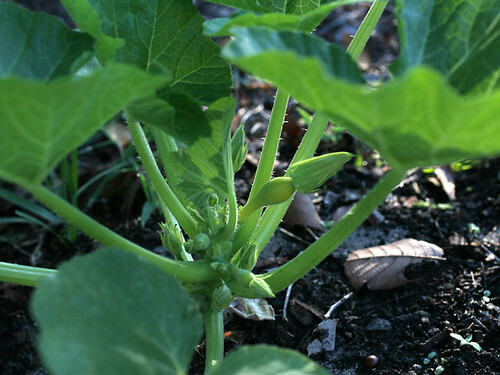 An added bonus is that the plant produces large, tasty, edible beans that surpass soybeans in nutritional value. 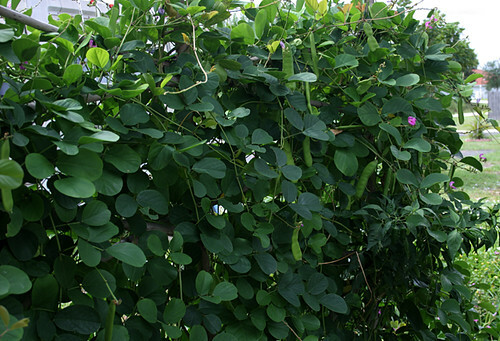 As I lamented the fact that so many of my fellow Floridians do not take advantage of this local resource I discovered that Mike (our employer and friend) had picked up some beans and was growing them on trellises in his own yard. He gave me a couple of beans, which I quickly planted at the base of my bare trellis. It didn’t take long for the baybeans to take hold and fill up the trellis. I now regret that I did not place one more bar across the top, for the plant would have gladly filled it in. That is a project for a coming day. This amazing vine has thrilled the pollinators and is threatening to overtake the whole back yard. The biggest challenge is redirecting the tendrils so that they don’t strangle out every other plant in the garden. This is a battle that I am currently losing, due to the lack of time I have been able to spend in the garden. In the right hand side of the photo above, there is a tenacious habanero plant, which continues to present me with its spicy offerings; although they are almost invisible until they turn red. Here is a shot of 02 in all of its messy glory. We are getting lots of peppers, and AJ has taken over most of the bed with his collection of pineapple plants. At this point, I am letting nature decide what I am allowed to grow here. 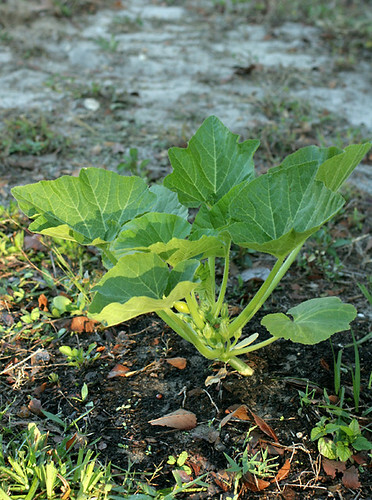 The baybean doesn’t give a hoot about nematodes, lack of fertilization, or even the fact that it has been given two five gallon buckets worth of soil to do its thing. It is growing and making beans like crazy. Yesterday I noticed that it was time to harvest. Here is a sample. 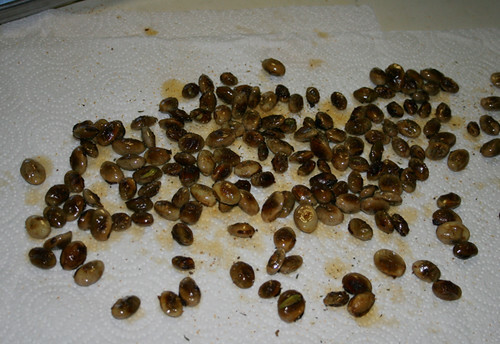 I picked a large strainer full of these massive beans and decided that I would try roasting them. 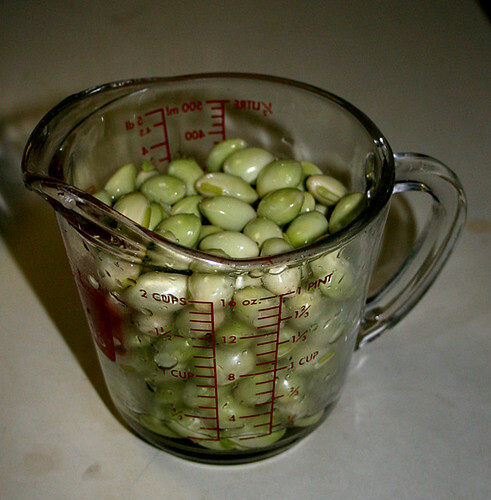 Due to their large size, they were easy to shuck and yielded almost two cups worth of the biggest beans I’ve ever cooked. I experimented by tossing them in soy sauce, olive oil, cayenne pepper and garlic salt before roasting them in the oven. They turned out good, and AJ even ate a few! 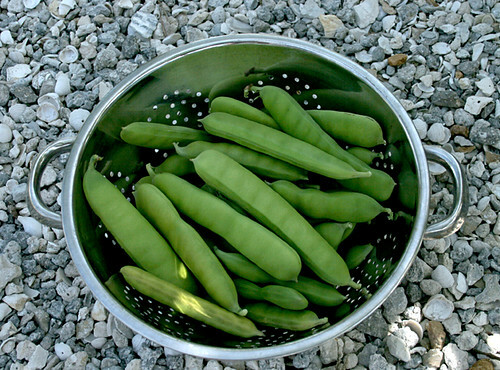 These beans are evergreen plants, so I anticipate many more harvests to come. The vines are loaded with pods which will be mature in a few more days. 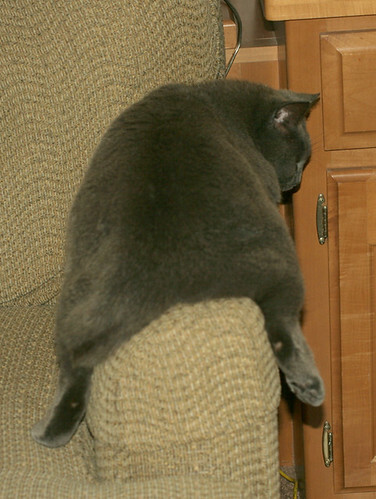 I’m glad he’s comfortable, because we have officially adopted Smokey. This makes me his fourth cat parent within a three year period and three lot radius area. 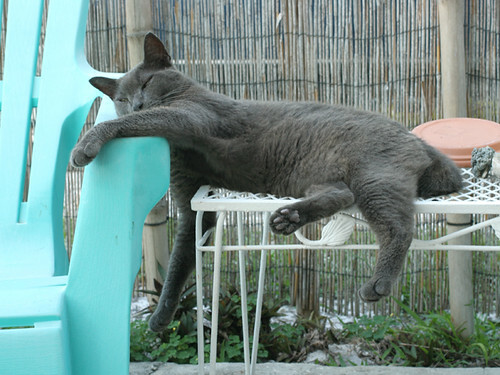 Make yourself at home, Smokey!